Manhattan District Attorney Cyrus R. Vance, Jr., today announced the sentencing of JEREMY WILSON, 43, to 7-to-14 years in state prison for engaging in a variety of forgery and stolen property schemes in New York and Boston. On March 8, 2017, a New York State Supreme Court jury found the defendant guilty of all the charges in the indictment against him: Forgery in the Second Degree, Criminal Possession of a Forged Instrument in the Second Degree, and Criminal Possession of Stolen Property in the Third and Fourth Degrees. As proven at trial, between December 2015 and January 2016, WILSON impersonated individuals using various means. He fraudulently acquired a luxury apartment and car, and used forged documents and identification, including fake passports from Canada and the United Kingdom, to commit crimes in Boston and New York. Posing as a British Airways executive, the defendant obtained a corporate apartment in Boston, where he stole a corporate credit card from the Massachusetts Institute of Technology and forged checks using an account number associated with a local business. Using the alias “Jeremiah Asimov Beckingham,” the defendant also claimed to be an Army veteran. On December 31, 2015, an NYPD detective tracked the stolen BMW to a parking garage in Lower Manhattan, leading to WILSON’s arrest five days later, and the recovery of a stolen MIT corporate card, forged California driver license, and fraudulently obtained Actors Federal Credit Union debit card. 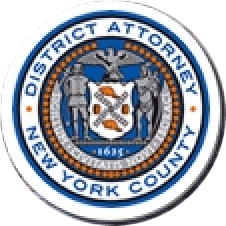 A search warrant executed by the NYPD and Homeland Security Investigations at the defendant’s apartment in Manhattan also revealed the defendant to be in possession of two forged passports. Assistant District Attorney Diego Diaz handled the prosecution of the case, under the supervision of Assistant District Attorney Gloria Garcia, Deputy Chief of Financial Frauds Bureau; Assistant District Attorney Archana Rao, Chief of the Financial Frauds Bureau; Assistant District Attorney Emilio Estela, Deputy Chief of Trial Bureau 70; Assistant District Attorney Al Peterson, Chief of Trial Bureau 70; and Executive Assistant District Attorney Michael Sachs, Chief of the Investigation Division. Trial Preparation Assistant Marissa Volpe assisted with the investigation and trial. District Attorney Vance thanked the following individuals and agencies for their assistance with the investigation: Detective Michael Dealmeida of NYPD’s Border Security Enforcement Security Task Force; the Cambridge (MA) Police Department; and Homeland Security Investigations.